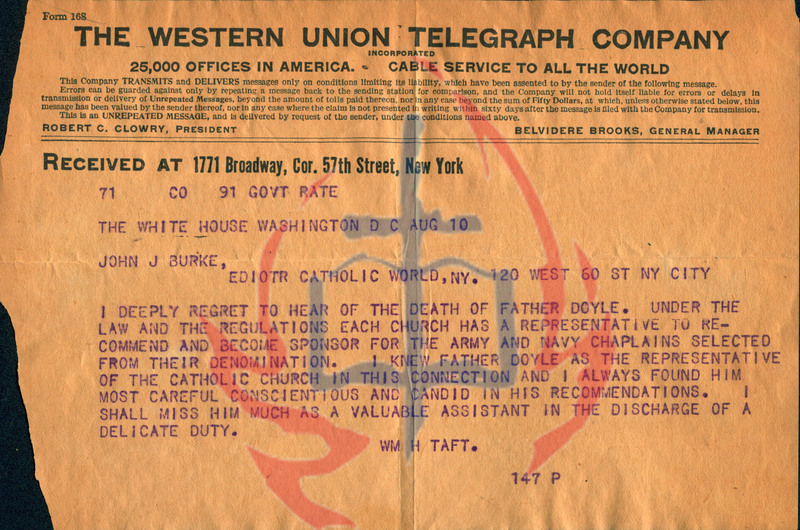 This telegram is addressed to Father John J. Burke from President William Howard Taft concerning the recent death of Father Alexander P. Doyle. Fathers John J. Burke and Alexander P. Doyle were both Paulist Fathers who were actively working to ease the burdens of the poor while adhering to a higher calling . The timeframe for this correspondence was August 10th 1912 one day after the death of Father Alexander P. Doyle. The telegram was sent from the White House in Washington D.C. to New York where the Paulist Fathers have a General Office. Father Burke worked as an assistant to Father Doyle who was working as the editor of The Catholic World magazine, a Paulist journal founded by Father Issac T. Hecker. While working to help others in New York Father Doyle became good friends with President Theodore Roosevelt. Father Doyle first met the future president Roosevelt when he was a New York City police commissioner. Father Doyle at this time was serving at the Church of St. Paul the Apostle in Manhattan. President Roosevelt admired Father Doyle’s tireless work for the poor and underprivileged. In 1903 Father Doyle and President Roosevelt would continue their friendship after Father Doyle was assigned as a rector of the Apostolic Mission House in Washington, D.C. where President Roosevelt was serving in office after the death of President William McKinley. Father Doyle’s indefatigability undoubtedly inspired this telegram from President Taft to Father Burke concerning the death of his former colleague Father Doyle. Fathers Doyle and Burke only worked together for one year when Father Doyle passed away in 1912. In the telegram President Taft mentions the “law and regulations” concerning the selection of chaplains for military service. In 1905 Father Doyle was appointed to act as a Catholic military chaplain representative to the federal government. The Catholic Army and Navy Chaplain Bureau was unified by Father Doyle as a response to the laws and regulations mentioned. With World War I on the horizon the National Catholic War Council was created in response to the great need for chaplains due to war being declared by the United States in 1917. Father Burke would serve as the visionary head of this organization working hard to supply the needs of the chaplains serving in the United States and abroad. In 1857 William Howard Taft was born at home in Cincinnati, Ohio. William Taft was a well-respected graduate from Yale and an excellent lawyer. By 1886 President Taft was encouraged to run for the office of president by his friend President Theodore Roosevelt. President Taft served in office from 1909 until 1913. The tireless work of Fathers Doyle and Burke speak volumes about how much they cared about the underrepresented people that they were trying to help. Both men put their passion into action through the organizations that they served and their efforts were recognized on a national scale. Their work is inspirational to the Vincentian Mission to give of ourselves and use the talents that were given to us to help others. Sheerin, J. B., Never Look Back: The Career and Concerns of John J. Burke, New York: Paulist Press, 1975. This entry was posted in Paulist Fathers and tagged Academic Service-Learning, Father Alexander P. Doyle, Father John J. Burke, paulist fathers, President Roosevelt, President Taft. Bookmark the permalink.